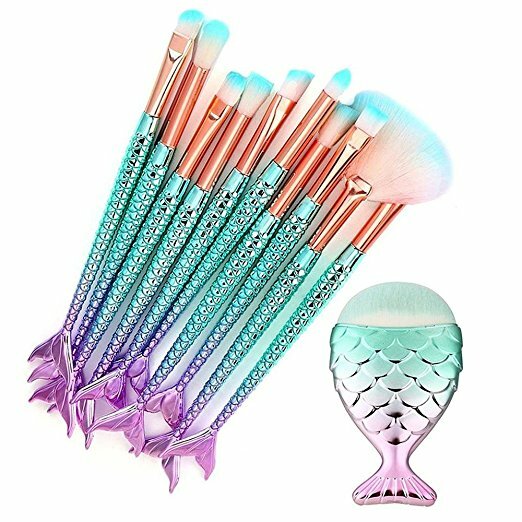 These Mermaid Tail Makeup Brushes are too cute to pass up. I purchased this set a couple weeks ago because I needed some blending eye shadow brushes, and ladies this set is gorgeous! I still can’t believe I paid only $8.99 for the set. My favorite tool from the Mermaid Tail Makeup Brushes is the fishtail foundation brush. It is so darn cute! And it’s included in this set. My favorite part of this brush is how well it works and it doesn’t waste product. The hairs on this Mermaid Tail Makeup Brush Set blend perfectly and are ultra soft so they won’t scratch your face like some of the lesser brands sold on Amazon. The foundation brush doesn’t soak up the foundation so it blends into your face a needed, wasting less product. Shipping is free when you have Amazon Prime, but you don’t have Prime your order ships free when you purchase $25 or more in qualifying products. And if you don’t have Prime you can get a free trail of it here.